Hart and Cooley has a selection of wall registers, wall grilles, floor registers, floor grilles, baseboards, ceiling grilles and registers. No rust and corrosion resistant anodized aluminum registers are ideal in high moisture areas and will last for years. Beautiful baseboard vent is crafted with a sunburst design which allows air to flow in three directions. The return air grill is 18" long and has a protective enamel coating to prevent corrosion. Our cold air return vent has a turn back of 7/8" from the wall. This baseboard vent covers body is made out of all steel and has no damper on the back. This no rust bathroom wall vent is great to use in rooms with high levels of moisture. Made from all plastic, this white vent will direct air bidirectionally at your will. Our 4 way commercial air vents provide large air volume delivery with its three tiered cone faceplate. Use this drop ceiling vent in your commercial location and install without any hardware. These insulated drop ceiling air vents are great to use in commercial areas with a 24 x 24 ceiling grid. 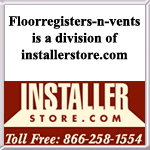 Our commercial vent covers have a 360 degree air deflection and come in your choice of 5 core duct sizes. This butterfly damper is round and can attach to the 4 way commercial drop ceiling vents. Sliding clips are used for attaching them to the grilles duct collar and can be easily be opened or closed with provided handle. Available in 5 sizes and finished in a golden sand color. Steel toe kick return grill by leading manufacturer Hart & Cooley. Available with the enamel finish white or golden sand. Hard-to-find 10 inch round ceiling diffuser at a great price. This white round ceiling vent comes with a butterfly damper to control airflow. Hard-to-find 12 inch round ceiling diffuser at a great price. This white round ceiling vent comes with a butterfly damper to control airflow. Hard-to-find 14 inch round ceiling diffuser at a great price. This white round ceiling vent comes with a butterfly damper to control airflow. 10 inch round ceiling grille made of all steel with an attractive, clean white enamel finish. This round air vent does not contain a damper to control airflow. 12 inch round ceiling grille made of all steel with an attractive, clean white enamel finish. This round air vent does not contain a damper to control airflow. 14 inch round ceiling grille made of all steel with an attractive, clean white enamel finish. This round air vent does not contain a damper to control airflow.